I’m just gonna come right out and say it. I’m cheap, y’all. Unless we’re talking about dog food (my dog dines better than I do, no question) or paying/tipping people for friendly services well rendered, I’m always going to figure out how to get the most bang for my buck. This means I will either: a) find a way to make the wanted items myself or b) patiently search high and low for the best deals. Truth be told, my love for making stuff stems as much from my characteristic thriftiness (which I’m pretty sure I inherited from my mom) as it did my innate desire to create. All of this to say that I’m not opposed to faux organic decor (including plants — check out my post on how to make fake plants look real! ), if that means I’m saving money and/or time by going faux. But it does NOT mean that I will settle for having stuff in my house that I’m not 100% aesthetically pleased with. It’s a huge (el-cheapo) IKEA bookcase that’s a whole lot darker than I’d prefer it to be, so I really wanted to add pops of color to the shelves (to draw attention away from the overt IKEA-ness of the bookcase). I love the shape and hue of red coral, but buying authentic coral (as much as I’d love to have it) was out of my price range. So, I researched my DIY options, and found this genius method (on Ohohblog.com) for making faux coral using wire, hot glue, and paint — stuff I already had in my craft stash anyway. If you make stuff on the regular, you probably do as well. If you don’t, these materials are very affordable and can be used for literally hundreds of other projects. 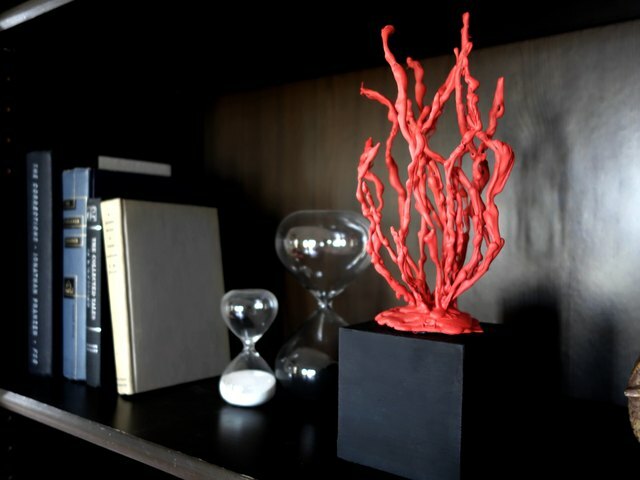 I pitched a faux coral video tutorial to eHow and they loved it. So I made it, and now I present it to you. Hop on over to eHow for my full tutorial.